Can Volatility ETFs & VIX Futures Blow-up the Stock Market? The VIX Futures market has been on a bit of a tear—driven by inflows into volatility ETFs like Barclays’ VXX, VelocityShares’ XIV and TVIX, and ProShares’ UVXY. 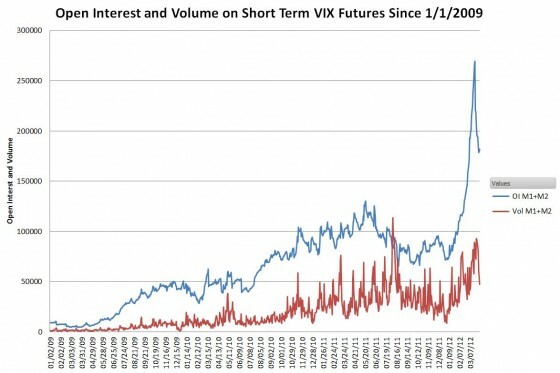 The chart below shows the resultant growth in the short term futures open interest and volume. The data doesn’t look as dramatic if we change the vertical axis to a logarithmic scale—a scale that makes it easier to see if the rate of growth is changing. 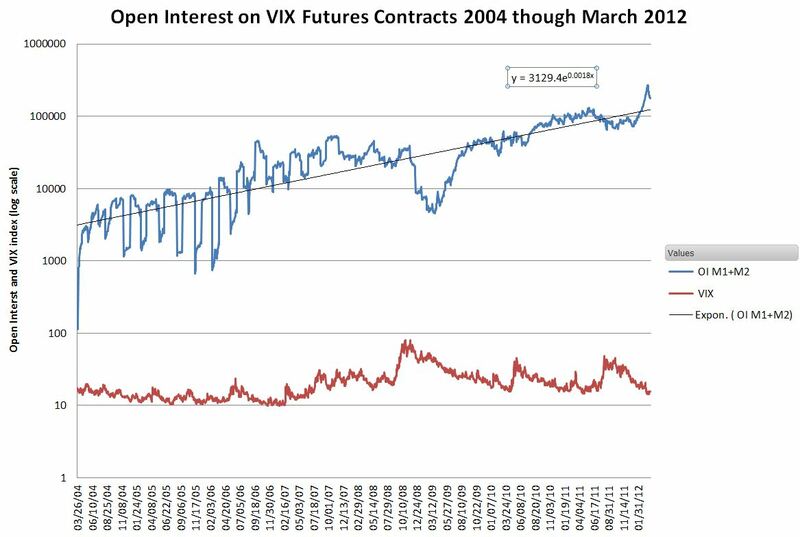 The chart below shows the short term VIX futures growth in open interest from the beginning of trading in 2004 compared to the VIX index. The open interest has doubled pretty consistently every year and a half since inception and doesn’t show any signs of slowing down. In the early years institutions drove growth, but the current growth in VIX futures is dominated by the volatility ETFs. The largest, Barclays’ VXX with $1.8 billion in assets under management, only needs to grow another 15% to become one of the top 100 biggest ETFs. What will happen as the demand for volatility increases? When demand for a physical commodity like gold increases the price goes up. The increased price helps satisfy that demand in two ways: current owners sell their holding to take their profits, and producers are motivated to obtain/make more of it. If the price increases enough previously uneconomic sources (e.g., lower grade ores) might become profitable. On the other hand, increased production might strain the ability of suppliers to provide required materials and create supply disruptions and price increases in other areas. Even though volatility can’t be eaten, alloyed, burned, or worn the same thing happens when demand goes up. The price increases, some holders sell, and producers (futures market makers in this case) make more of it. In some cases historic price relationships might start changing. Volatility comes in lots of flavors and timeframes—for example, historical, intra-day, projected, and implied, but no one had figured out how to buy or sell it until the CBOE created the VIX index in 1993, and tweaked it specifically so that it was suitable for the futures market in 2003. The key to creating this market was the ability of market makers to sell futures tied to the VIX index and cost effectively hedge their positions with S&P 500 (SPX) options. The VIX index is an ongoing estimate of volatility 30 days from now derived from SPX option implied volatilities. It’s not without its warts. It does a crappy job of estimating big volatility changes even a day or two in advance and it has Friday/Monday distortions that have nothing to do with volatility 30 days out. The VIX futures market ignores the VIX’s dumber quirks, and forms its own opinions about what the future holds. VIX futures are only guaranteed to synchronize with the VIX index on the day they expire. The rest of the time the prices for volatility futures shift according to the laws of supply and demand and often do not track the VIX. During panics, near month futures prices have traded $23 below the VIX and during calm times $4 above it. The longer dated futures diverge even more from the daily VIX index values depending on market expectations. Talking about the “right” price for volatility is like talking about the right price of gold or gasoline—ultimately it only matters what the market says. There is some evidence that the increased demand for volatility futures is changing historic price relationships across the various markets—even during this quiet phase of the market. Volatility is still tiny compared to the overall market (less than $5 billion vs. the $12 trillion market cap of the S&P 500 ), but we can’t ignore the possibility that volatility might have a very high leverage effect on the market. It only takes one person yelling “fire” to panic a crowd. VIX futures are highly interconnected with the S&P 500. 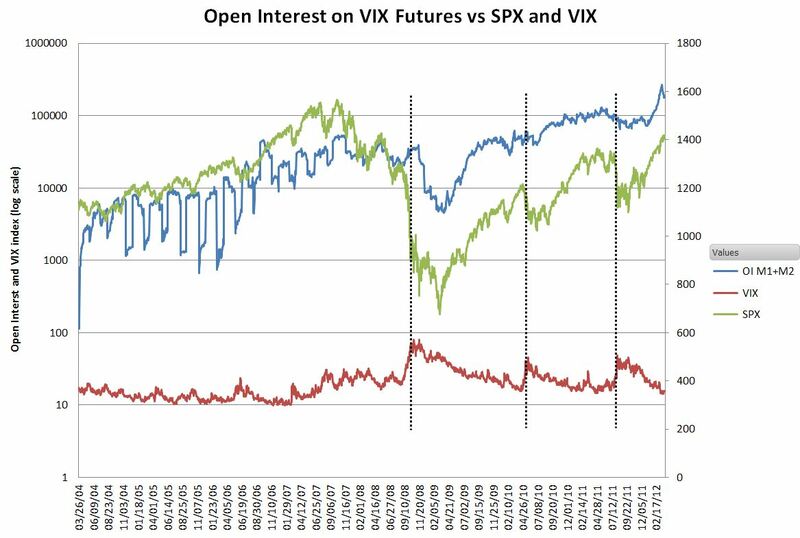 In times of panic will increased demand for VIX futures dampen volatility swings, or will it feed the flames of fear? The option market makers that sold the options are now short delta–among other things. They hedge their delta exposure by buying the appropriate number of SPX futures. Since the VIX futures market makers and the SPX options makers are both delta hedging the same set of options (on different sides of the trade) the net of their actions on the SPX futures market should cancel each other out. So, for at least for a first level of approximation the creation of VIX futures contracts should have a neutral impact on S&P 500 prices. What the market maker actually does is dependent on their inventory, and they have alternate ways of hedging, but I don’t think any of the alternative approaches would change the ultimate effect on S&P 500 prices. My analysis indicates that as the VIX futures market grows it will have a neutral influence on the overall volatility of the market. A final observation. People commenting on the growth of the VIX futures market often note that the current surge in demand has occured during a relatively quiet market. If volatility goes up additional demands due to required rebalancing for inverse and leveraged funds could spur additional contract purchases. These demands are proportional to the assets under management, which should roughly track the open interest on volatility contracts. 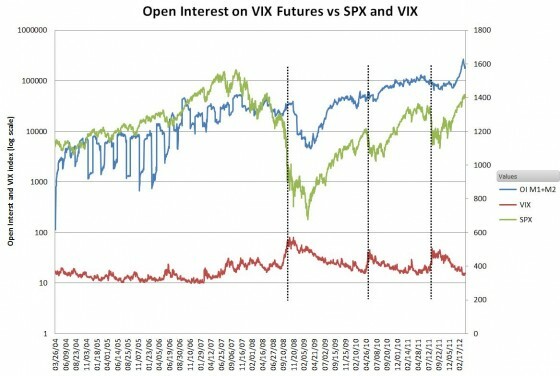 The chart below shows the open interest on the short term VIX futures compared to the VIX index and SPX (it uses the non-logarithmic scale on the right). The dashed vertical lines mark the major volatility peaks of the last 4 years. Besides the spooky correlation between the log futures open interest and SPX, the other thing to note is that the future’s open interest stayed flat or dropped during these market crashes/corrections. 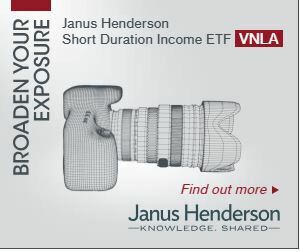 The inverse and leveraged volatility funds were not a factor before 2011, but during the 2011 correction XIV and TVIX were running combined daily volumes in the tens of millions so the last correction included some contributions from them. 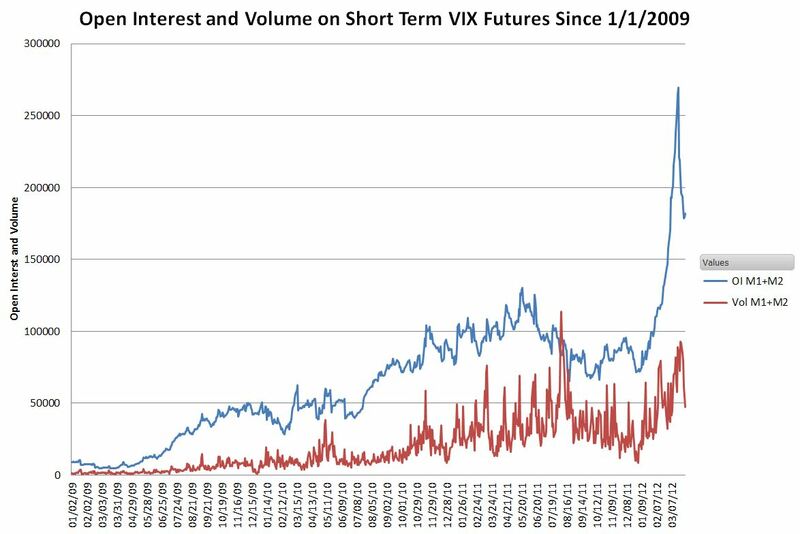 This data shows that historically the demand for VIX futures does not spike with the VIX, but rather the spike marks the beginning of decline in the short term demand for futures. As the VIX futures market grows I expect we will see disruption of some historical price relationships, but I think the answer to the big question—will they crash the market, is no.